Hiya! I’m back with another edition of Famous Fridays. Celebrity cookbooks seem to be all the rage now. There’s Chrissy Teigen’s which I’m loving and promise to share soon, Joanna Gaines’ which is fun and sweet but a lot of the recipes rely on too much butter, cream and processed foods so the verdict is still out on it for me and Reese Witherspoon’s which I haven’t even laid eyes on yet, to name a few. Now, I don’t know about you, but I’m always a little bit skeptical of cookbooks written by folks who became famous for something other than their cooking. So what a lovely surprise to find that At Home with Natalie: Simple Recipes for Healthy Living From My Family’s Kitchen to Yours by Natalie Morales, (think Today Show and Access Hollywood) is a real cook’s cookbook and one I’ve been turning to again and again over the last couple of months. You’re gonna love it and these gorgeous Spinach, Mushroom & Cheese Empanadas. TGIF!! I’ve been watching Natalie on TV for years, so it’s kind of fun to get a chance to see her life behind the camera a little bit and the fact that she’s just like the rest of us moms—trying to juggle keeping her family eating healthy with the demands of work, school, sports schedules etc. At Home is a terrific compilation of easy, nutritious, unfussy recipes that will make doing everything you do, a lot easier and more tasty. Natalie literally grew up all over the world and has parents with Puerto Rican and Brazilian roots and all of this travel and cultural exposure is definitely reflected in the book. There are recipes for standard American fare like Effortless Buckwheat Pancakes, Healthier Mac & Cheese and Chicken Cobb Salad with Avocado-Yogurt Vinaigrette as well as more traditional family recipes like Black Beans & Classic Brazilian Rice, Slow-Cooker Ropa Vieja ,Pollo al Ajillo (Garlic Chicken) and this more modern twist on the traditional empanada that I know you’re going to love! It was tough figuring out what to feature from her book for this post because so far everything I’ve made has been spot on delish, but in the end the fact that I’ve always wanted to make empanadas and never have and that the Super Bowl is coming up and I was thinking that these would be fun to serve (it’s all about the food for me!) won out. Also, with the weekend coming up, these are a not-too-time-consuming project that would allow you to make them ahead and freeze. A win-win all around! Now you could buy ready-made empanada dough but if you can possibly swing it, I would really advise you to make Natalie’s homemade version. It comes together really easily in one bowl and homemade dough is always better than store bough. After you’ve cut the butter into the flour mixture, you simply make a well and pour the egg mixture into it, mix with a fork and chill. Meanwhile, you make the filling, which is nothing more than sautéed onions, mushrooms and spinach. Easy-peasy and good for you too! Once the dough has rested, you roll it out, cut out circles (I made them about 3-inches, Natalie makes them double that size but I wanted to use them as something small and snacky) and place a little dollop of filling in the middle. And add a sprinkle of cheese. Take my advice and resist the urge to overfill. You’ll see why later. Then you use your finger to brush a little egg wash all around the outer edge of each circle to help seal the dough once you fold it in half. The tines of a fork help to lock everything in tightly and give it that iconic empanada look. Right before you’re ready to bake, you brush the tops of the empanadas with a little more egg wash which allows them to bake up shiny and golden brown. In about 30 minutes, you’ll find yourself willing to suffer a burned tongue just to gobble down one or two (or three) of these delightful little homemade Hot Pockets. Gotta love that light and flaky pastry! And wonderful savory, cheesy filling! Now. remember a few paragraphs back when I warned you not to overfill? As you can see from some of the overflow, I didn’t heed it myself! If this happens to you too, no worries—I promise that people are going to be too busy gobbling them down to care! So pick up At Home with Natalie—I really think it’s a cookbook you’ll put to good use. We’re home this weekend (no hockey to travel for) so I’m thinking about tackling a babka (it’s been on my to-do list forever) and this wonderful quinoa oatmeal we had last week when we were down in DC. Whatever is on your agenda, hope it’s yummy! Have a great weekend!! 2. Place the 2 cups of flour and salt into a large bowl and whisk together. Use a pastry cutter to cut the cold butter into the mixture until it resembles a coarse meal with little pea shaped pieces of butter. Make a well in the center of the mixture and pour the egg mixture into it. Use a fork to stir until almost all the flour is incorporated—it’s ok if some of it is not mixed in-you don’t want to over mix. Turn the dough out onto a floured board and knead until it’s smooth. Form into a ball and flatten into a disc. Wrap it in plastic wrap and chill for at least 1 hour and up to 24 hours. 3. Meanwhile make the filling: In a large skillet, heat the oil over medium heat. Add the onion and mushrooms and cook for about 7-8 minutes, stirring often, until the onions start to soften and the mushrooms begin to brown a little. Add in the spinach and cook for a few minutes, tossing it often, until it is wilted but still bright green. Add the broth, season with salt and pepper and stir. Cook until all the liquid has evaporated. Set aside. 4. When you’re ready to assemble the empanadas, preheat oven to 350ºF. Line a large baking sheet with parchment paper and set aside. Tear off another piece of parchment paper and lightly flour it. Now flour a large board and roll out the dough with a rolling pin to about 1/8-inch thickness. Use a 3-inch cookie cutter or an upside down mug or glass to cut out rounds. 5. Place the rounds on the floured paper. Place a small spoonful of the filling into the center of each round and sprinkle with a little cheese—try not to overfill or things will seep out as they cook—not that this affects the taste but they won’t look as neat. Use your finger to take a little bit of the egg that’s beaten with the water and brush it around the outer edge of a circle of dough. Fold the shell over and use the tines of a fork to help seal the edges so that you have a little half moon. Repeat with all the remaining dough circles. 6. Transfer the finished empanadas to the lined baking sheet. Brush the tops with the egg wash and bake for about 30 minutes, or until golden brown. Let cool for 5 minutes or so and serve. 7. You can definitely make these ahead, bake and reheat and though I haven’t done it yet, I suspect they would freeze well too. Line the unbaked but filled empanadas on a baking sheet making sure they have a bit of space between them so they don’s stick together as they freeze. Don’t brush with the egg wash. Once they are frozen, remove from the freezer and store in an airtight bag. 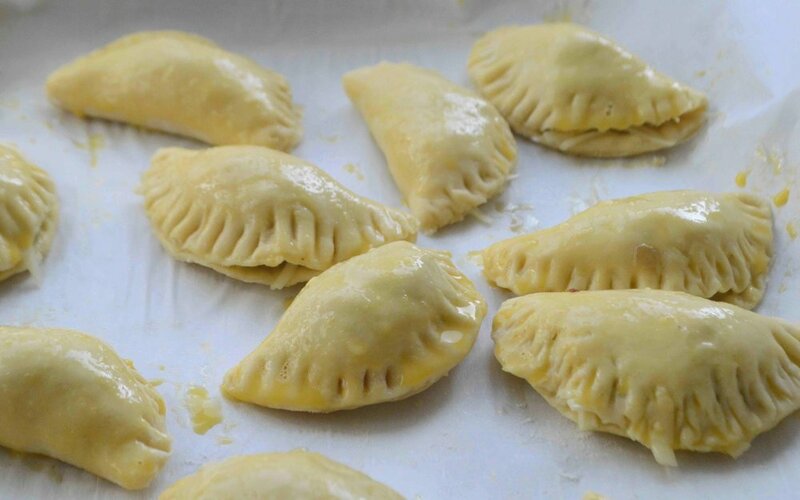 When ready to bake, simply line a tray with the frozen empanadas, brush with the egg wash and bake. Note: Recipe adapted from At Home with Natalie by Ann Volkwein and Natalie Morales. I cut the dough out into 3-inch rounds instead of 6 to make mini-empanadas, tinkered with the proportions of veggies and subbed in a swiss/gruyere mix instead of using manchego.